Tablet weaving in progress. By Lionel Allorge (Own work) [GFDL , CC BY-SA 3.0 or FAL], via Wikimedia Commons. The subject of this paper will discuss adapting period patterns for modern looms in order to tackle the problems presented by using modern tools for period narrow weaving. This is not exclusive or proprietary; as I will discuss, I stumbled upon this technique by accident. This technique is also an adaptation to a modern loom, and I know of no examples supporting this as a period technique. My argument is that it is possible, and easy, to maintain the integrity of period patterns when working on a modern loom without relying on modern solutions. This technique could be similarly applied to more period techniques of tablet weaving, such as the backstrap method, as another means of handling the problems associated with some of the more complex period patterns. Tablet weaving is one of my favorite art forms because it spans so many periods and cultures. Evidence of Iron Age tablet weaving exists as far back as the 8th century BCE and continues through until at least the 15th century. The most recognizable examples, and my area of interest tend to revolve around the Norse cultures commonly mislabeled as “Vikings”. This paper is not meant to address the history or cultural significance of tablet weaving, so that is all that I will add to the historical overview. One of the specific problems associated with tablet weaving is “twist”. Tablet weaving is worked by turning tablets forwards or backwards in order to create the “shed” necessary for any type of weaving. As the tablets are turned forwards or backwards to create a pattern, the warp fiber to be woven ahead of the cards begins to twist in a lane. The more that any particular card is turned in one direction, the more noticeable this twist will be. If your pattern has a different number of forwards and backwards turns among the cards, twist will develop along the warp lane/s of the card/s with the uneven number of turns. For example, if your pattern has 24 cards and cards 1-20 turn four forward and four backwards (4F/4B), but cards 21-24 turn 8 times backwards (8B), lanes 21-24 will develop twist. This becomes a problem as the overly twisted yarn becomes unusable. It also creates tension variance along the width of the band, which will affect the overall quality of weaving throughout the piece. In period, a tablet weaver would tie their warp to two points. There are examples of period looms where these points are two posts that can be adjusted as the weaving tightens towards completion. Below we can see a 15th century image of Mary weaving using such a technique. Another technique is referred to as the back-strap method. With this technique the weaver ties the working end of the weave to a horizontal bar tied to their waist, and the other end to a post. Both of these methods allow the weaver to deal with twist by untying the end to be worked and combing out the twist. Mary weaving in the Temple. 1410. Illuminated Book of Hours. Koninklijke Bibliotheek, The Hague, Netherlands. In the SCA we have become particularly innovative in our ability to adapt modern sensibilities to the recreation of period arts. Modern tools are used to help expedite the period process across the entirety of SCA arts. Gas stoves, propane torches, pvc pipe, and many other conveniences make the pursuit of period arts easier and more accessible to a greater population of the SCA. One of my favorites is the portable tablet loom. This ubiquitous SCA loom has allowed countless artists to pursue the various types of narrow work over the SCA period. It is an incredibly practical device allowing complex weaves to be transported to events for teaching, learning, or just getting through court! The problem with the modern loom is that it does not allow the weaver the opportunity to untie one end to comb out developing twist. There are two solutions that SCA weavers have employed to combat this issue. One is to work with undocumentable modern patterns, and the other is fishing swivels. These are modern solutions to a problem created by a modern tool, and to me represents a further step away from period accuracy. The first solution is to use one of the thousands of really stunning undocumentable patterns that have evenly counted turns. For the bulk of my weaving experience, I was limited to these patterns because I did not have a suitable method for dealing with twist developing unevenly across the band. There are many period patterns that can be worked using an even number of forwards and backwards turns, eliminating this concern entirely. I had a habit of doing prettier, undocumentable patterns instead. The second solution is to use fishing swivels. My knowledge of period fishing is extremely limited, but I suspect that these ingenious little devices are not period. In my experience, this technique didn’t do me any favors. Tie one end of your warp to an end of the swivel, travel the warping pattern of your loom, then tie the other end of the warp to the other end of the swivel. I found tying the cards to fishing swivels to be extra annoying. The swivels also didn’t play nice on my loom. After a few attempts, I abandoned this method and just stuck to patterns as a means to combat the twist problem. 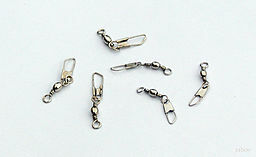 Fishing swivels. By User Raboe001 [CC BY-SA 2.5], via Wikimedia Commons. There are a lot of really great period patterns that do create uneven twisting. My favorite patterns came out of the Birka find. There are so many great shapes. Keys, hooks, knots, basket weaves, fylfot (swastikas), and many more. Before they became associated with 20th century evil, swastikas were actually very cool. So in order to recreate the more complex patterns on the modern loom, I had to come up with a means to combat twist. It is possible to maintain the integrity of the period patterns simply by mirroring the motifs! This is actually easy to accomplish, and I will demonstrate the turn diagram that I use and then how to adapt it for the new technique. I only write down the third highlighted column as a personal shorthand to read turning patterns. I use a regular piece of notebook or notecard and use the top line for forward and the second line for backwards. I am using three columns to explain how I read the third column in shorthand. The below pattern is completely arbitrary, but a good example of the erratic turning counts found in complex period weaves. 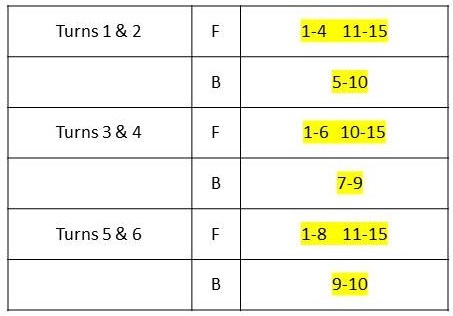 As you can see, cards 1-4 & 11-15 constantly turn forwards, card 9 always turns backwards, and the rest have some variation. This will create different twists. Cards 1-4 & 11-15 and 9 will always develop the same amount of twist, in different direction. With the remaining cards turning at uneven intervals, these lanes will all develop different tensions. This is typical of the complex weaves I wanted to add to my portfolio of work. In order to mirror the motif from the above pattern, I will add a few turns forwards and backwards to create visual and physical space between motifs. The number of turns is completely based on what I think “looks good”. This could be any number, but I like to use 4-10 as a rough guide. Then write the pattern from bottom to top completely inverting the turning directions. What I end up with is two rows read in a circle from top left to bottom left, bottom right to top right, then back down on the left. I have used different highlighting colors to show the pairs that are inverted. Write down the mirror of the pattern by directly inverting the turning instructions for each row. 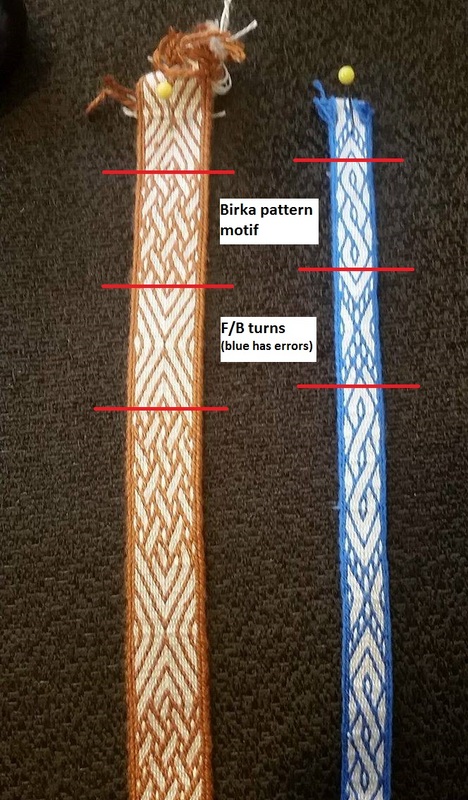 The picture below shows the completed technique using elements from various Birka bands. I hope that this technique will help you in your weaving! Good luck, and have fun! Samples of my tablet weaving using this trick. Click for a larger image.